Toshiba’s range of reverse cycle split systems and reverse cycle split system units are designed for flexibility in application and with a low operating sound level and improved air quality. 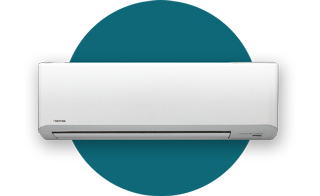 So you get all round comfort plus precise temperature control, in a reverse cycle split system unit which is sleek, stylish and backed by the famous Toshiba Air Conditioning warranty and support. Popular Toshiba reverse cycle split systems are available from many quality dealers Australia wide. View our range or find your nearest dealer today.